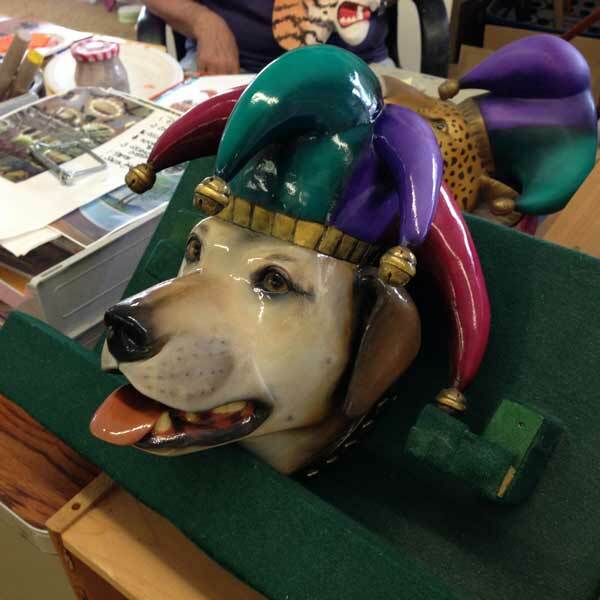 After our jaunt down the Oregon Coast, we headed inland on a route that would see us visit 5 wonderful artists studios. 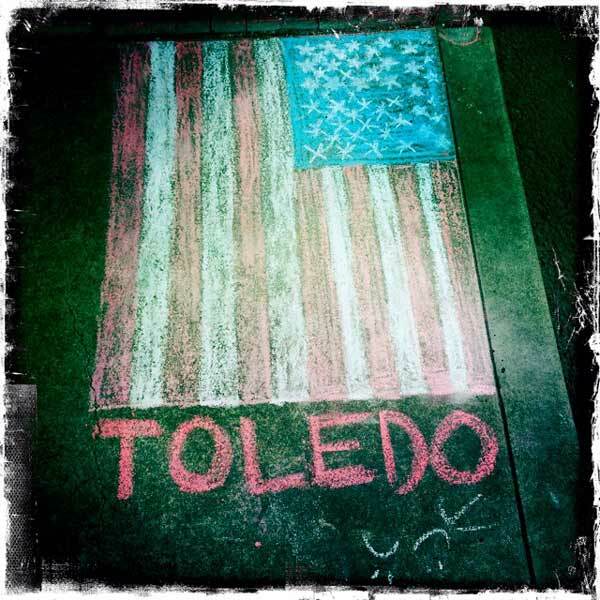 From Newport, we hit Toledo on our way to visit Clint Brown in Corvalis. Toledo was an interesting small place but Monday morning saw many things closed. We peeked in windows and walked in some open doors in this little artist community. 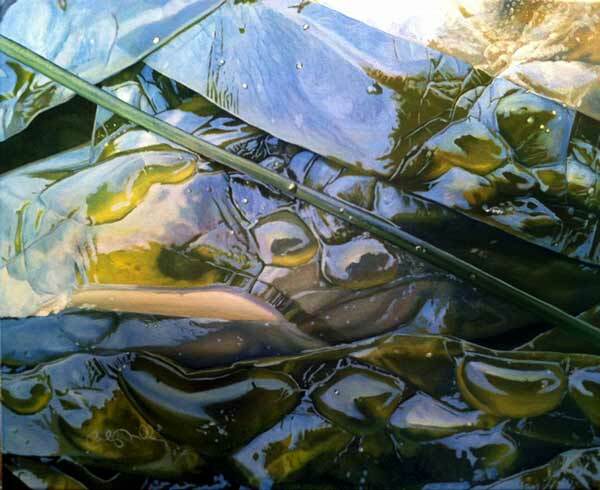 Becky Miller kelp paintings were very impressive. She lives here and her works caught our attention in Newport. 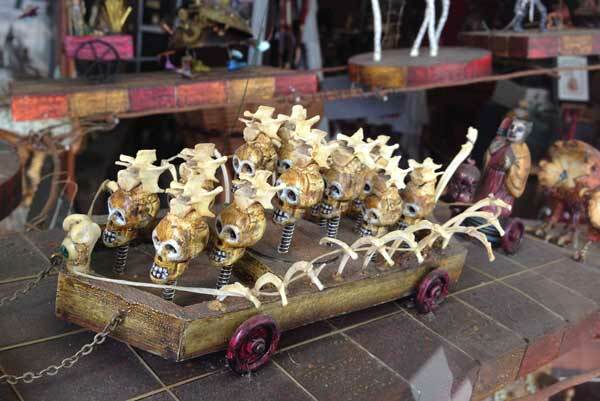 Janet Runger, kooky imaginative tiny works of sculpture seen and photographed through a closed Things Found window. Wild!!! Michael Gibbons took a break before going off to build some frames for his touring exhibition to show us around his home studio. 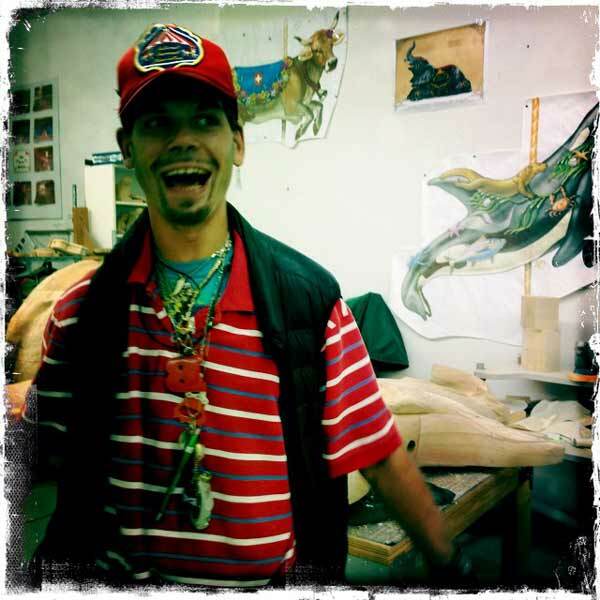 Very well organized, Micheal is a very prolific painter and teacher. Lively plein air oil landscapes with almost a pastel feeling about them. He just got back from organizing a large Paint Out at Portland Art Museum last weekend. He has a “paint mobile”, a Jeep in which he can whizz off to inspiring plein air locations, paint his heart out and get the works back home still in good shape. He’s certainly perfected the art of moving wet oil panels, something we’re going to work on back at home soon. Hubby and I plan to work together to make some wet traveling boxes for oil panels. Quick sketches in my 5 x 8″ Moleskin watercolor books are good but oils are the real deal! I am thirsting to work larger in oils as soon as busy life allows. 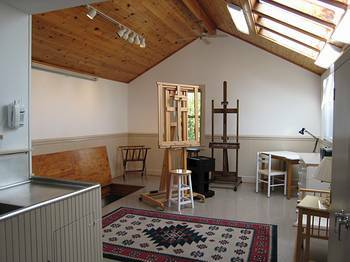 While traveling in France on a painting trip one year, Michael and his wife Judy discovered housekeeping accommodations that included studios for working artists. Reasoning that this sort of rental would be good for artists coming to the central Oregon coast, they renovated this historic building from Toledo’s past as County Seat and the old Justice of the Peace building became a snug haven for artists. 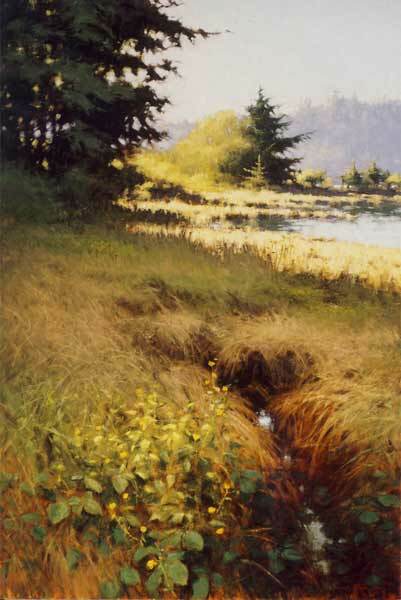 Just two short blocks up the hill (Toledo is sometimes called little San Francisco) from the sparkling Yaquina Bay, the location is perfect for walking painting trips, boating and birding. We could definitely see ourselves coming to rent his little art cabin and coming to paint here, very appealing! 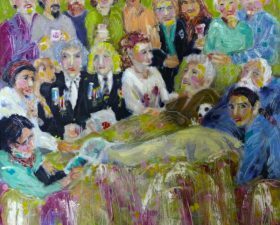 Michael Gibbons website features his artwork and classes, check it out. On to Corvalis, a medium sized town with some great architecture in its old town section which is where we always start. 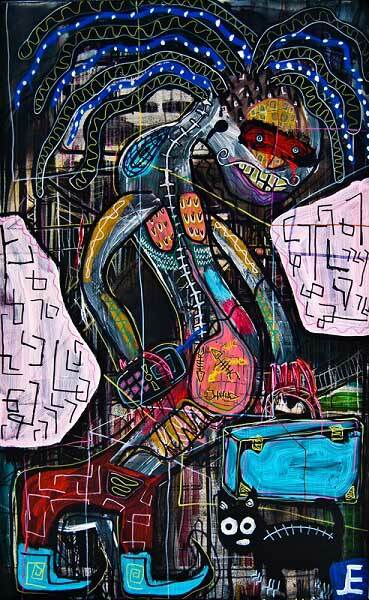 At Corvalis Arts Center we came across works by Johnny Beaver, with a big Basquiat influence. Interesting, gutsy. 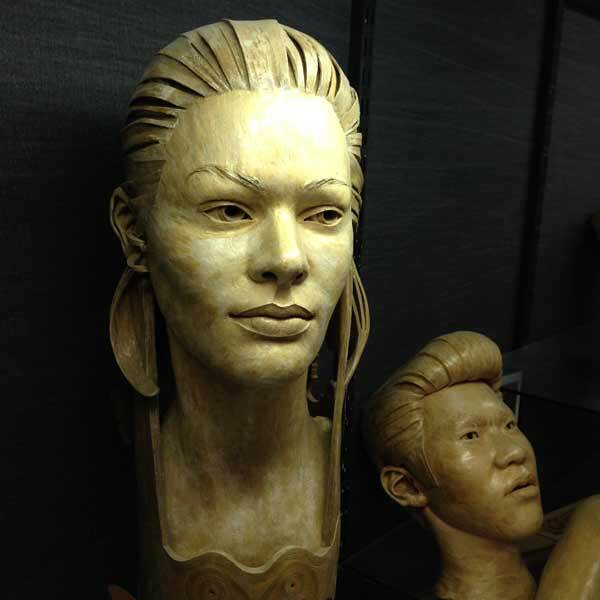 The Pegasus Gallery shows the amazing wood sculptures of the late Earl Drebing, carved wood faces, extraordinary works! 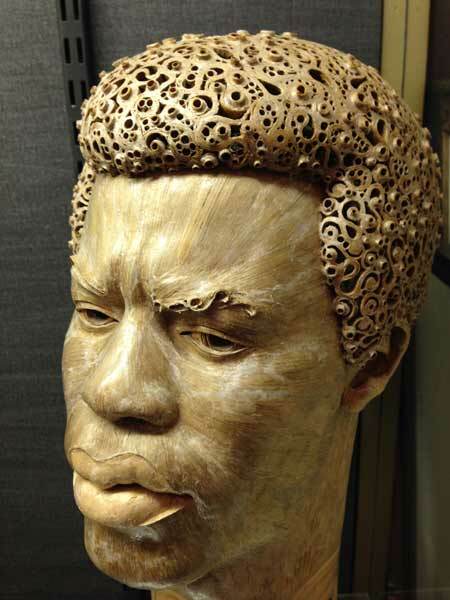 A humble furniture maker, he was self taught as an artist and created these very beautiful and fully realistic portrait sculptures from wood waste and glue from the furniture factory. 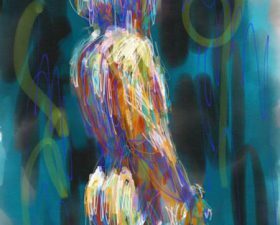 It is a very fascinating body of work that hopes to find a home with a figurative art collector some day. Lovely young blond woman sitting at Starbucks table repeatedly just spitting down in sidewalk beside her chair. Too many low slung pants on women old enough to know better and sharing their (non) interesting lacy things rear view with us. 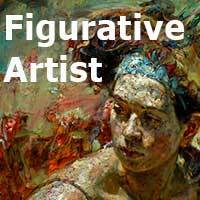 We arrived at figurative artist Clint Brown’s just in time for evening drinks, a studio visit dinner and his generous offer of overnight hospitality. 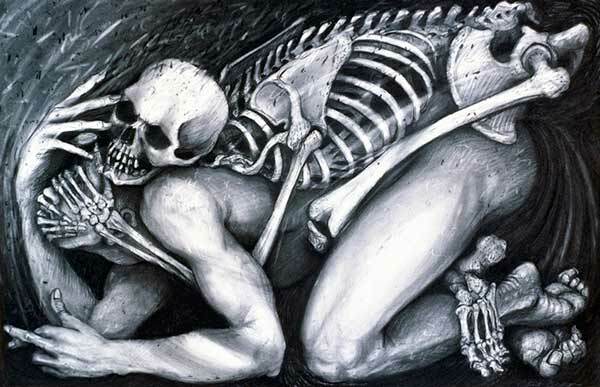 His work, above, with strong drawings and sometimes skeletons as in his Plague drawings series. Read all about our visit here. Leaving Corvallis took us through lovely rolling hills, horse country and many beautifully manicured vineyards. 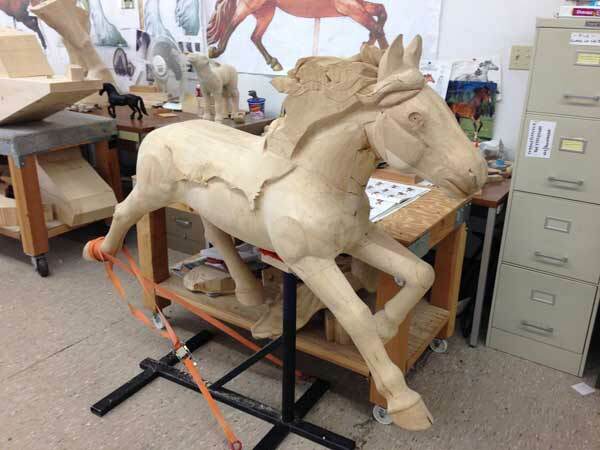 We stopped in Albany for a little wander up the street and stumbled across their huge project, the Albany Carousel. 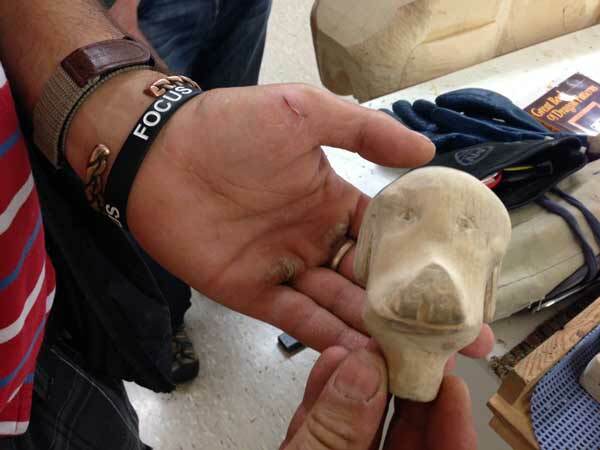 They are 10 years into carving this project with only non-professional volunteers working away at it. What a glorious project and vision!!! The paint work is all stippling, no brush strokes. Very very polished results, and so imaginative. Met this enthusiastic young man, Bill. 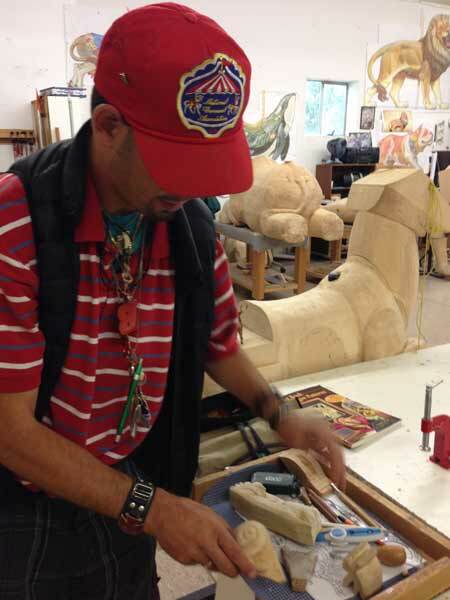 He comes to work here 5-6 days a week from from a local group home (for developmentally challenged folks) where he lives or else “They take a hissy fit if I stay home.” Bill was charming, proudly showed off his carving skills at his own little work station in the bustling large wood work shop. I loved his personal style, and the big red B around his neck. What a character. We were so glad we fell in through this front door. What a special adventure and treat it was. I am a huge vintage carousel fan and this is one of the best I’ve ever seen. It’s new, so imaginative and old fashioned but totally today at the same time. Bravo!!! Visit Albany Carousel website. 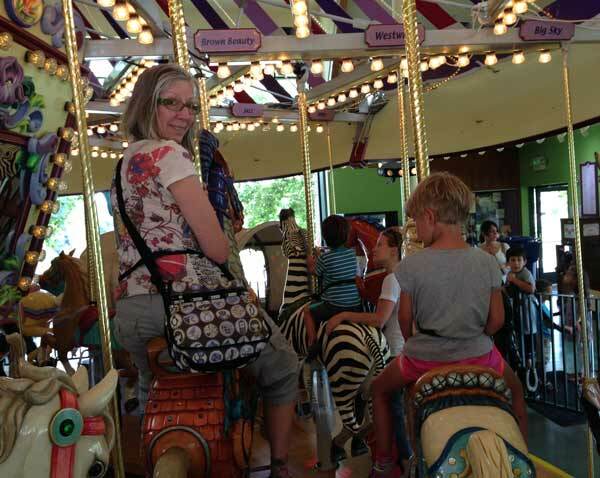 We actually took a spin on the carousel at Salem’s Riverfront Park, our next stop on the road, nice but Albany’s is much more magical. Before our studio visit to figurative ceramic artist Sara Swink, we popped in to a West Linn quilting shop of exceptionally high standards. 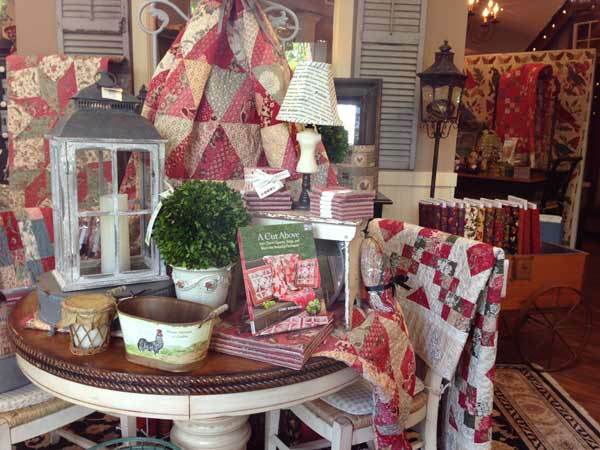 Hollyhill Quilt Shoppe & Mercantile, beautiful decor, exquisite quilt models elegant and temptingly draped in the varied display areas. The best quilting shop I’ve seen in maybe a decade. No photos allowed so this one taken through their door. Quilting seems very active and busy in Oregon. 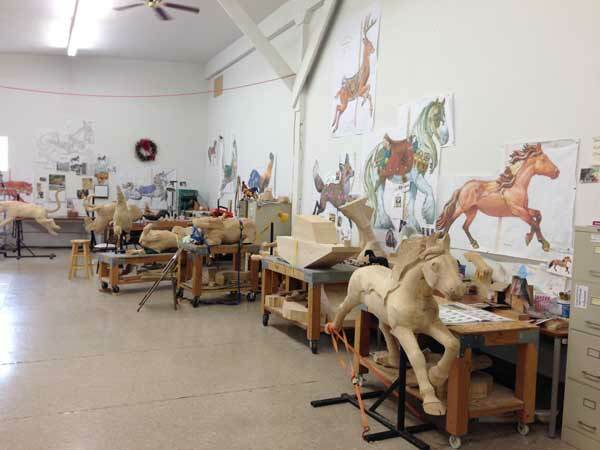 At 2:30 we visited the working clay studio of ceramic sculptor Sara Swink. 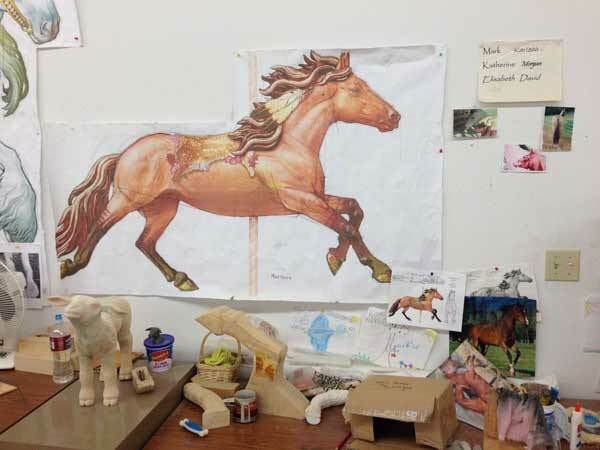 Very impressive workspace and imaginative works in clay. Read about our visit. 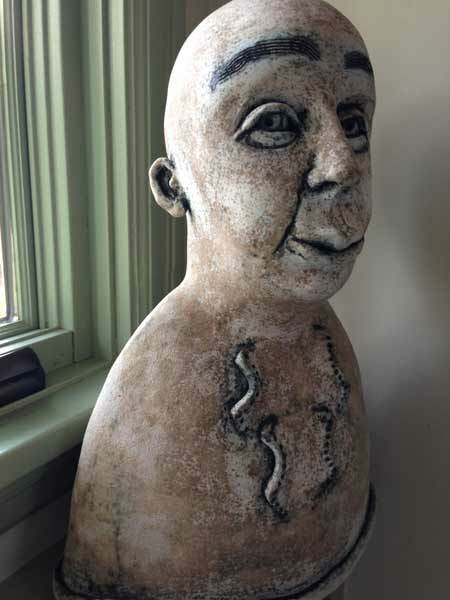 We pushed on and visited another talented and spunky ceramic artist, Swedish Kicki Masthem, arriving just in time for a little glass of wine and a studio, home and garden tour. 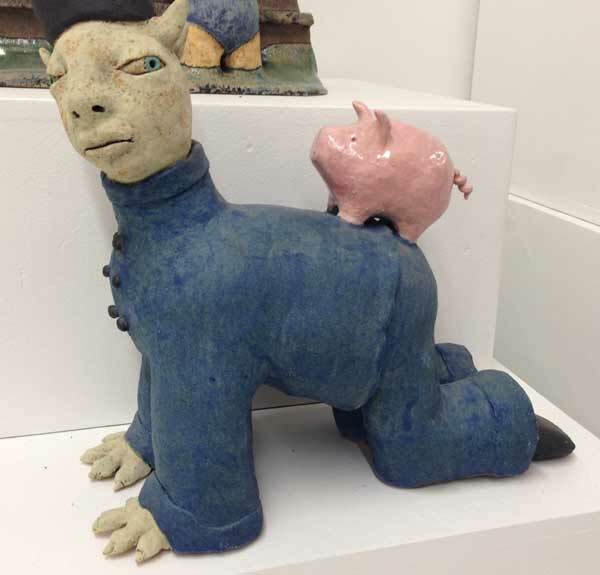 She has a little slice of country in the city with chickens, bees and bunnies as well as her funky ceramic sculptures of people. Read about our studio visit. 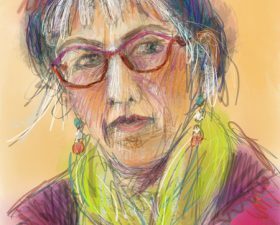 We stayed in Portland for 3 nights, visiting the Portland Art Gallery, wandering interesting neighborhoods and galleries and fitting in our final artist studio visit. 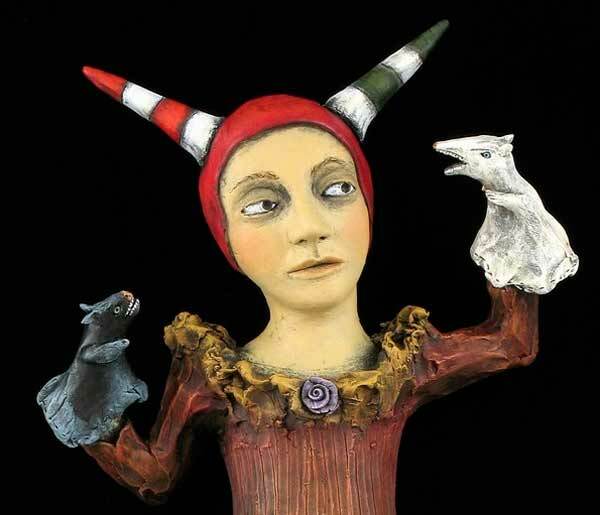 Jacquline Hurlburt creates colorful, imaginative ceramic sculptures as well as quirky paintings of people doing some rather odd things. Check out our studio visit.